Fluid crepe dress stuns with white pearl buttons, sweet billowy sleeves and a detachable grosgrain bow-shaped brooch centered with rhinestones. Contrasting collar adds a layer of classic preppy vibe. Just slip on some heels or loafers and you're ready to go. Flirty crepe mini dress is perfect for warmer days. Take a closer look at the print and discover which animal is hiding between the dots. 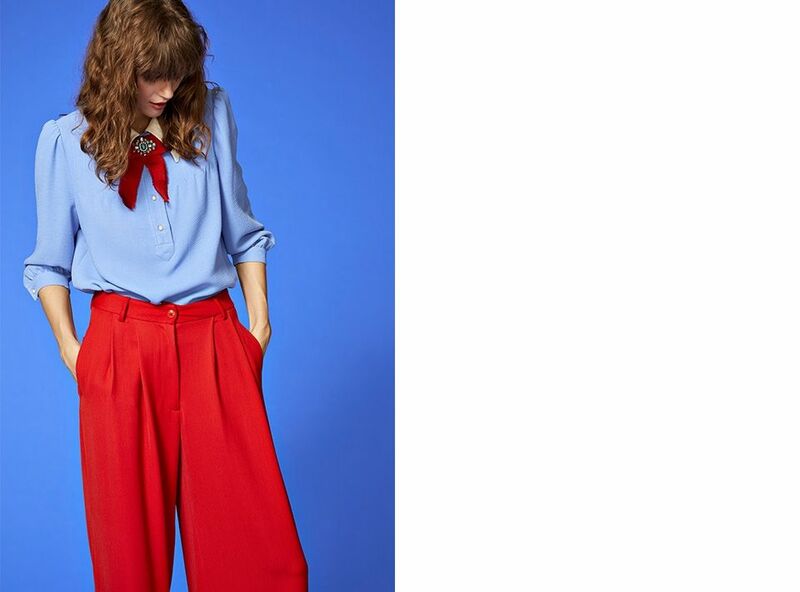 We wear it with chunky shoes while a grosgrain belt and pleats accentuate the feminine fit and flare silhouette. Flattering figure-skimming wrap dress is a classic. Playfully designed with a print of cats and scattered dots, it accentuates the figure. Grab your shoes, purse and don't look back! Lightweight floral dress is crafted from fluid silk and has a straight cut. Lustrous details like a pleated yoke with topstitching, white bow fastening and pearly buttons add to the preppy feel of the dress. Keep your styling simple and slip on black heels. Streetwear, sportswear or cosywear - it all goes for this soft cotton sweatshirt. We took it up a notch and detailed it with a drawstring hoodie, subtle white embroideries and printed lettering on the left sleeve. Ideal for off-duty. Full lace skirt featuring horizontal stripes and vertical pleats will instantly show your sense of style. Smooth lining and an elastic waist ensure a comfy fit. Styling is easy, simply match your top to one of the colors featured in the skirt. Classic white leather sneakers are updated with a string of rhinestones and a camouflage print pull tab at heel. The cushiony leather lining and supple rubber outsole ensure the most comfortable fit. We'll be wearing our low-tops with trashed denim. Modern design is combined with Janis Joplin nostalgia in this style. This cotton poplin top is whimsically embroidered with abstract rabbits, birds, hearts and stars. The wide sleeves are reminiscent of the seventies peace and love era. Wear yours with a high-waist mini skirt and flats. Reconstructed two-tone denim jeans feature on-trend raw hem. Classically detailed with ocre topstitching, 5 pockets and belt loops, we love to see it with a soft sweater and kitten heels. Kitten-heel pumps are covered in a lush velvet fabric and embellished with pearls and rhinestones. The adjustable slingback strap has a comfy elasticated panel for flexibility. Channel your inner Audrey Hepburn and wear this pointed-toe pair with everything from cropped denim to pencil skirts. Shoulder bag in a cotton fabric shell shows an eclectic style. The cool camouflage print is countered by the ladylike frayed bow with a center of rhinestones. The leather-trimmed chain adds the final touch of timeless flair. Get yours while it's still here! Delicate blooming flowers ring in the new warmer seasons. Our floral wrap dress is all you need for a romantic summer look. It's detailed with bell sleeves, fabric string fastening and the lining adds to a soft handle and smooth fit. Luxurious mohair wool blend sweater is extra soft and warm. We love the lightweight handle despite the naturally warm materials. Ideal for tricky transitional months when the weather can't make up its mind. Wear it solo or with the embroidered mock shirt collar. Turn heads in this mesmerizing pink and red plissé skirt. We love how the lightweight fabric, striped motif and lurex threads create an irresistible sway. Tone it down with a simple sweater and sneakers or dress it up for an occasion. Webbing-striped knitwear is a musthave this season. This plush Italian-made cardigan is spun with touches of wool and gold webbing that playfully accentuates the red stripes. Style with denim and loafers for an effortless but chic look. Belgian design and Italian craftmanship resulted in this sumptuously soft sweater, knitted with touches of wool and alpaca. We love the combination of dramatic V-neckline and loose fit. Easily layer yours over a shirt and style with denim for a full on-trend look. Vivid bow-shaped brooch is encrusted with multicolored rhinestones forming a striped pattern. The piece is detailed with a felt base to ensure a comfortable fit and protect the clothes. Wear this glistening design centered at the collar of a blouse. Catch the summer breeze with fluttery sleeves, light fabrics and a looe fit. This mini dress is detailed with a delicate floral print and a classic button-up collar. Wear with espadrilles or flats for instant holiday vibes. Sturdy cotton coat is designed in a classic and slightly masculine cut. 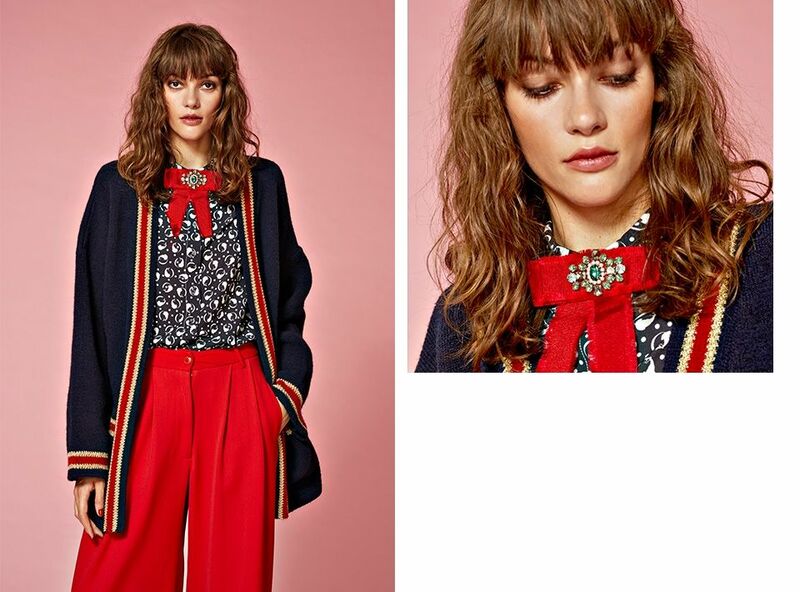 Blind stitching, simple patch pockets and streamlined shapes give a sleek appeal while bold embroidery, bright red lining and a detachable bow-shaped brooch add visual interest. Easy-going cotton twill trousers will definitely earn their stripes in your wardrobe. The striped side panel adds a right on-trend feature, while the tailored fit and hint of stretch ensure plenty of comfort. Go for casual glam with our sporty bomber cardigan, playfully embroidered with clusters of multicolored sequins. The loose cut is enhanced by dropped shoulders and ribbed trims. We like it best worn unzipped over a graphic tee for a casual but standout look. Soft cotton-jersey T-shirt is boldy printed with 'No Drama' lettering.Spread the message and keep it simple, just do a half-tuck into jeans. Fun and flirty A-line mini skirt sits comfortably at the waist. Small shiny polkadots add texture and pleats enhance the voluminous cut. The styling possibilities are endless. Summer shirtdress is detailed with a print of blooming florals, ruffles and chest pocket. The belt cinches at the waist and the length of the dress falls just above the knee. Keep cool and wear yours on sultry days. Swish away with our printed mini dress, playfully scattered with swirly dancing leaves. The flared sleeves, A-line cut and fluid fabric add to the flattering sway en fit. Style with heels for your next festive occasion. Intricate guipure lace dress is layered with floral lace cutouts, bell sleeves and a subtle A-line shape. We like how it's partially lined for enough coverage and has a smooth feel against your skin. Wow the crowd and wears yours on romantic dates. Airy bohemian top is making us long for warm summer days. Made from a lightweight embroidered wool fabric, detailed with voluminous sleeves and a boxy cut, it creates a casual look with skinny jeans. Go for luxury, comfort and whimsical florals with this soft cotton cardigan crafted in a floral print silk fabric. The deep V neckline and elastic ribbed trims nicely add definition to the voluminous cut. Easily add a dash of personality to your look and layer it over crisp shirts. Italian-made classic cotton poplin shirt is detailed with small ruffles along the button placket. Available in two basic but oh-so versatile hues. Wear it to the office, tucked into wide-leg pants, jeans or mini skirts. Brooches are a girls best friend this season. The multicolored brooch is perfectly symmetrical and detailed with a felt base to ensure a comfortable fit. We'll be wearing ours centered at the collar or on the lapel of a blazer. Go big or go home with our oversized cotton poplin shirt. The crisp collarless design features a hidden button placket and slit sides that emphasize the volume. Keep it nonchalant and roll up the cuffs. Straight-leg jeans are made with a hint of stretch for a comfy fit while rolled up cuffs add a cool note to the effortless design. Wear them off-duty with sneakers or counter the distressed look with heels. Meet Paulie, the most fashionable rabbit in town. 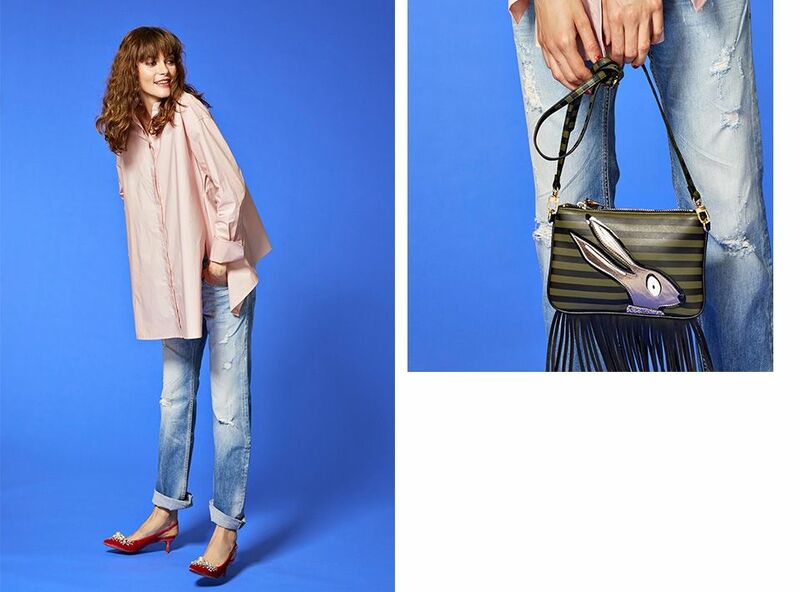 The design of this shoulder bag harmoniously echoes his love for stripes, fringes and just a hint of glitter. Fun yet practical, the lined interior keeps your phone, lipstick and cash neatly stored. This feminine design is spun with insulating mohair and soft alpaca wool. Fall in love like we did for the Italian craftsmanship, plush texture and knitted ruffles. The loose cut is ideal for cozy layering on capricious weather days. Striped fine-knit sweater is blended with touches of wool for a cosy feel without it being too warm, making it perfect for in between seasons and layering. Style yours with or without the included brooch, a frayed grosgrain bow featuring a center of rhinestones. Light and fluid blouse is detailed with a of delicate floral print and subtle ruffles along the button placket. A great addition to your work wardrobe. Wear it solo or with a chunky cardigan. Show your preppy side with this fluid crepe top. Expertly detailed with white pearl buttons, billowy sleeves and a detachable grosgrain bow-shaped brooch centered with rhinestones. The straight cut works well both tucked-in or loose. Lightweight crepe pants are cut in a wide-leg shape and sit flatteringly at the waist. We like how the clean cut design has subtle pleats at the waistline to sculpt the silhouette. Try yours with a bright top.